The Fire Company - The Fire Company Inc.
SVI Tucks we can help build Rescues, Walk-In or Walk around, Command, Air and Light trucks. We have DEMO's from Toyne and SVI give us a call. The Fire Company Inc was started by two friends who have a combined 86 fire service years. Roger and Chuck have been friends since working on the Grand Rapids Fire Museum in the 70s. Chuck was a member of the Wyoming City Fire Department before moving to Mackinaw City where he and his wife purchased a candy store. Chuck joined the MC Fire Department where he is still a active fire officer. Roger remained in Grand Rapids, got married and raised two sons. He and his wife purchased a farm house with acreage outside of Allendale were Roger rebuilt the barn into his restoration shop. He put in a machine shop to restore Ahrens Fox fire apparatus. In 2001 Roger joined Chuck working for another dealer and they deepened their friendship. In 2005 they started The Fire Company. Roger and Chuck have moved up to the TOYNE family of fire apparatus. 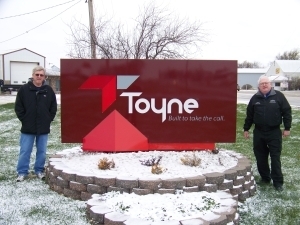 They chose Toyne because Toyne does custom apparatus, and are US family owned and operated company. Toyne has been a sound choice because stainless steel units are of the highest quality and workmen ship. With the new addition of Toyne’s High Quality Reasonably Priced (HQRP) units they have an advantage over other manufacturers. The Fire Company and Toyne have been a good match. On June 1st 2016 Chuck retired as Vice President of the The Fire Company Inc. After 25 years selling fire apparatus He has made the move back to his candy store. He and his wife Ginny had to take back the store and it has proven to be more work to bring the store back to its old way so it was a move that was needed. You can stop and see Chuck and Ginny any day making candy in Mackinaw City we wish them well. Chuck has also retired from fire fighting after 53 total years he has turned his pager off and works with Emergency Management in his spare time.